The growing market for electric vehicles has led to much higher demand for battery metals such as cobalt, lithium and nickel. 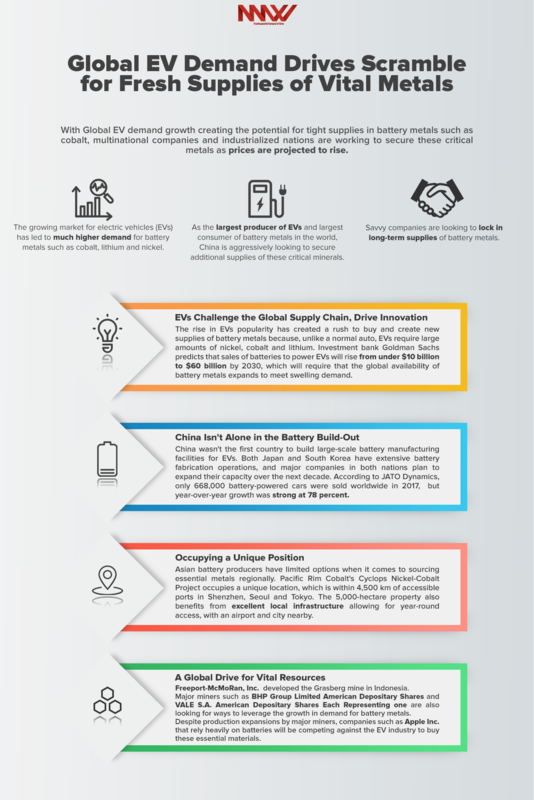 As the largest producer of EVs and largest consumer of battery metals in the world, China is aggressively looking to secure additional supplies of these critical minerals. Savvy companies are looking to lock in long-term supplies of battery metals. Driven by the technological advances and environmentally friendly advantages offered by electric vehicles, the long-awaited EV revolution seems to be taking hold. Numerous global corporations are competing for access to limited supplies of battery metals. Prospective cobalt producer Pacific Rim Cobalt Corp. (OTCQB: PCRCF) (CSE: BOLT) (PCRCF Profile), which just released a detailed corporate update, looks to be in an ideal position to supply those corporations with cobalt. Major miners such as BHP Group Limited (NYSE: BHP), Freeport-McMoRan Inc. (NYSE: FCX) and VALE S.A. (NYSE: VALE)could play a role in growing the global supply of nickel, cobalt and lithium. Apple Inc. (NASDAQ: AAPL)took the extraordinary step of looking for direct supplies of cobalt last year, which shows how heated the battery metals market has become.